An interview of Professor Richard Falk with Daniel Falcone on the future of NATO that considers Trump’s brazen challenges and the tepid responses of European political leaders, and what this interplay signifies for the future of world order. Daniel Falcone. What are the reasons for Trump’s insistence that NATO is just another extension of corruption and an institutional burden for the United States? Professor Richard Falk It is difficult to evaluate Trump’s particular moves from coherent rational perspectives. He seems driven by narcissistic motivations of various sorts that have little to do with any overall grand strategy, and a diplomatic style that he has managed to impose on the conduct of American foreign policy that consists of provocative bluster and insults of respected foreign leaders, a continuation of the sort of vulgar irreverence that brought him unexpected success on the presidential campaign trail in 2016 and earlier celebrity in the deal-making world of real estate, gambling casinos, beauty pageants, professional boxing, and reality TV (“The Apprentice”). Explaining Trump’s recent confrontational focus on financial contributions by NATO members seems as simple as this at first glance, but of course, such assessments based on personality never tell the whole story in the complex unfolding political narrative. Undoubtedly, another part of the story can be associated with the insistence during a Trump’s interview that Europe is a trade rival of the United States. A further conjecture may be a geopolitical ‘peace’ framework based on Russia, China, and the U.S..
DF. How do you forecast the European reaction to the Trump commentary on NATO and could you explain how this might impact key portions of US foreign affairs? RF: Europe’s governmental response to the Trump onslaught so far has been very disappointing, while recent civil society responses in Europe has been generally encouraging. On the one side, NATO leaders seem to pout like aggrieved children, angered and humiliated, but too frightened of the uncertainties associated with confronting Trump to raise their objections above the level of a whisper. 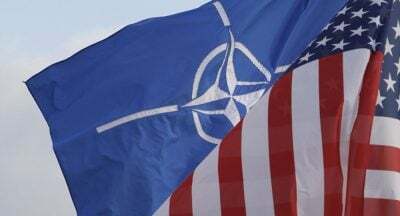 On the other side, their acquiescence to the Trump insistence that NATO viability is to be measured in dollars or maybe Euros, unaccompanied by even a pretense of putting forward a relevant substantive rationale for Cold War levesl of spending. Such passive aggressive behavior by European leaders is likely best understood as a sullen endorsement of Trumpism. In effect, the Europeans are muttering “yes, we in Europe should be allocating more of our resources to the defense budget and begin to live up to our 2% commitment” so as to keep a renewed watchful eye on Russia and go along with the slouch toward a Second Cold War. There is no justification given for supposing that Europe will be safer if more heavily invested in military equipment, and my view is that Europe would be far safer, more secure, and more serene if it instead invested these additional funds in helping alleviate the refugee challenge at both the asylum end and at its various sources where combat and climate change have made some national habitats virtually unlivable. It might be emphasized that these habitants from which people are escaping to Europe most commonly at great risk to themselves, have been rendered uninhabitable partly by industrialization in the West and by the bloody aftermath of European colonialism that left behind arbitrary borders that did not correspond to natural communities. DF. In the past US led and authorized NATO bombings are criticized rather easily and justifiably from the left, but what is the danger of the Trump mentality to foster a disregard for global order from the reactionary right wing? And does resistance to Trump cynicism put NATO skeptics on the left in a difficult position in your view? RF: I think that the ideological discourse has definitely been altered by Trump’s alt-right approach to NATO. The left, such as it is, has refocused its energies on resisting what it believes to be a slide toward fascism at home arising from its correct perceptions of the Trump presidency as racist, ultra-nationalist, chauvinist, Islamophobic, subverting constitutionalism, and haunted by demagogic leadership. Those most upset with the attacks on the alliance underpinnings of NATO are not the left, but rather the more centrist liberalconstituencies encompassing moderate Republicans as well as mainstream Democrats. These are persons likely as upset by the challenge mounted by the mildly insurgent left-leaning politics of Bernie Sanders as by Trump, perhaps more so. Trump is ardently pro-business, pushed through Congress tax reform that mainly benefits those, like himself, who are part of a tiny billionaire class. 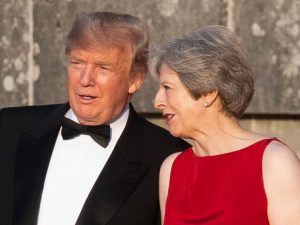 What remains of the liberal establishment, whether on Wall Street or situated in the dark inner and hidden recesses of the deep state, is on the verge of tears in the aftermath of Trump’s assault on the NATO anchoring of the Atlanticist approach to American foreign policy that became so iconic for the political classes comprising the bipartisan American establishment ever since 1945. DF. Trump was elected partly because of what amounts to his “Me First” Doctrine as well as his “Make America Great Again” slogan. Does he in your estimation fully intend to utilize NATO in the background while appeasing his rabid anti institution base? RF: Trump and his fanatical base in the U.S. never seem far apart. Even in pursuing trade wars around the world, especially with China, that harm many of those who voted for him, his rationalizations, invoking the ‘America, First’ language and jobs rhetoric whether or not the evidence supports such claims. Apparently, so far, a relentless demagogue can fool many of the people all the time, especially by the rants of a populist politic that takes delight in scapegoating outsiders and arousing rage against the insiders who are portrayed as reaping the benefits of the international liberalism that gave us both the Cold War world economy and produced a neoliberal predatory aftermath identified in the 1990s as ‘globalization’, a view of political legitimacy that combines a private sector economy with some minimal form of democracy. DF. Trump likes to portray himself as a populist alternative to the Bushes and Clintons and their reckless foreign policy while questioning our “exceptionalism.” In reality however we have broadened and expanded our presence around the world under Trump. Can you talk about the Trump foreign policy and how’d you categorize it? RF: Trump foreign policy, such as it is, seeks to diminish engagement with international institutions, including treaty regimes, and retain greater freedom of maneuver for the U.S. Government in international relations. It seems also to deny the reality of such global challenges as climate change, global migrations, genocidal behavior, and extreme poverty. It is definitely statist in outlook, both because of a belief in nationalism as the best guide to policymaking and problem solving, and because the United States as the richest and most powerful of states can supposedly gain greater advantages for itself by reliance on its superior bargaining leverage in any bilateral bargaining process. Borrowing from his deal-making past, Trump seems convinced that the U.S. will get more of what it wants when it deals bilaterally than in hemmed in my multilateral frameworks as in trade relations or environmental protection. 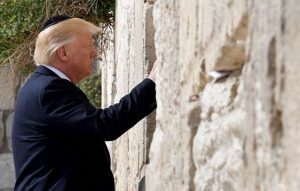 Image below: President visit the Western Wall, Jerusalem, May 22, 2017. Credit: Photo credit: Matty Stern/U.S. Embassy Tel Aviv.